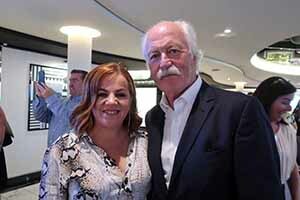 Rebecca Kelly, Head of Sales (Ireland) at MSC with ITAA President, John Spollen celebrating in style on board MSC’s Meraviglia when it docked in Dublin on Tuesday 28th August to celebrae 10 years of business in Ireland. Swiss-owned MSC, headed up in Ireland by Rebecca Kelly, celebrated 10 years trading in Ireland on board MSC Meraviglia with the news that 15,000 Irish customers sailed with MSC in 2017. MSC says the Mediterranean is its most popular destination for Irish passengers, with Western Mediterranean sailings from Barcelona and Rome most popular. In winter, 150 guests a week cruise out of Abu Dhabi. There are no immediate plans to homeport in Dublin, as Celebrity Cruises and Princess will do next year, though Paradiso says this is “definitely on my mind”. He said that MSC will plan a Dublin home port programme in its own way. Meraviglia is the world’s fifth-largest cruise ship with 5,700 passengers and 171,598 gross registered tonnes, behind four Royal Caribbean’s Oasis-class vessels. Guest amenities including 12 restaurants, Cirque du Soleil at Sea shows, several pools and a 96m central promenade with the longest LED dome at sea. MSC Meraviglia have to be steered stern first into Dublin Port until the current redevelopment of the Alexandra Basin will allow the vessels to dock as far upriver as the East Link Bridge by 2020. The ship arrived from Cobh, with two Irish stops forming part of a 10-night Britain and Ireland itinerary out of Hamburg with stops are in Southampton and Scotland.